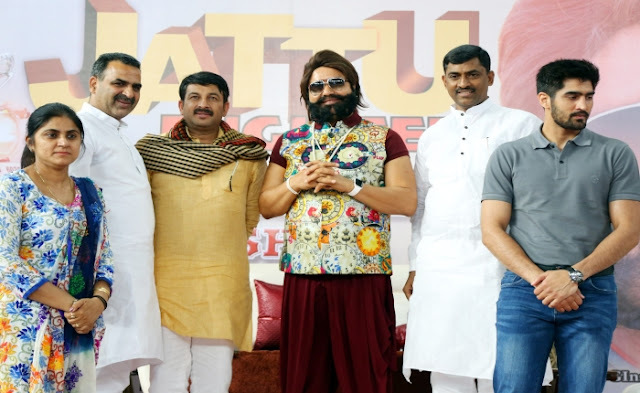 Jattu Engineer fulfilled it’s promise of healthy comedy as Premiere show sparked laughter all around. It was just another day but what made it so special was grand premiere of 5th movie of Saint Gurmeet Ram Rahim Singh ji Insan. “Jattu Engineer” a comedy genre with healthy entertainment. Thousands of movies are made every year, worldwide, and their premiere shows are organized by production giants, but what makes Jattu Engineer unparalleled, is the craze amongst its fans that captivated them to rush to the Capital city from all over the world. On 17th May, Indira Gandhi Stadium of Delhi witnessed a mega premiere event. On this wonderful occasion reverend Guru ji organized Cow milk party for the viewers that made a new record for the largest people drinking cow milk at a event with a whopping number of 19714 count. Delegates from The Asia Book of Records also attended this event to document and validate this record and they honored Guruji with a certificate and a shield. Revered Guru ji said that this party is first of its kind and we began this new kind of party as it is totally different from Wine, Cocktail parties and I would feel delightful if anyone breaks this record. Guru ji also raised concern in favour of giving Cow a national status. We are working for Cow welfare from 1994. At the time of Rajasthan drought Dera Sacha Sauda provided 3000K Kg grass for animals. We should not consider Cow a pawn of political game. Our religions considered it as Mother. And we should prefer drinking milk instead of Blood. Earnings of this movie will be invested for noble cause of DNA research and bone bank.